Why I volunteered to be a First Aider at work. Whilst I was off on annual leave my boss had sent an email out asking if anyone would like to be the department's first aider. Now, baring in mind there are 3 others in my department who have young children I figured at least one of those would have jumped at the chance - after all, accidents don't just happen at work! For me, I volunteered with a bigger picture in mind, my family, my friends. I want to be shown how to deal with a situation without freezing - I don't fight or flight apparently - I freeze - great stress response that is! So I set off for my 3 day course and I learnt about CPR, burns, wounds, choking, etc. 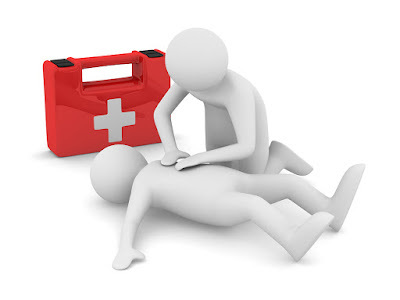 I learnt that as a first aider we do not panic, we do what we can, we do what is needed and no more, we will not be sued, we will use the AED with confidence as it is the defibrillator that will give your casualty a great chance of survival! I spent three days performing CPR on Resusci Annie and it's bloody knackering. I used bandage after bandage on rather yucky fake wounds and I learnt about heart attacks, sprains and strains. I found it valuable information to take back to work with me but more importantly to have as a life skill for my family, God forbid should I need it. I would recommend this course to every parent, it's a daunting thought and quite possibly the reason why employees do not volunteer? It is daunting, but wouldn't you rather be scared and able to help then scared and freeze? I found this piece on Medical News today - and up until my First Aid course - I got the answer wrong! "When faced with a man thrown off his motorbike and not breathing, 42% of respondents said they'd know what to do and then described the wrong thing. Of these, 43% said they would not move him for fear of spinal injury, yet if he's not breathing and does not receive CPR, he will die".